Every garden needs at least one rustic garden shed to store tools and garden furniture, hang around in during a sudden summer rainstorm, or simply as a unique and interesting folly. I'm lucky; I've got five! All are unique, rustic, fun and funky, all resembling old buildings in a western town. Some are used for functional purposes, others have the potential to be a she shed. There's something so appealing about replicating that look of an old town, using old barnboards, recycling windows, and making rustic crafts to decorate them. 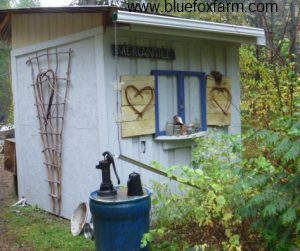 Don’t restrict yourself to a mass produced plastic or tin shed, be creative and find the rustic look that appeals most to you. 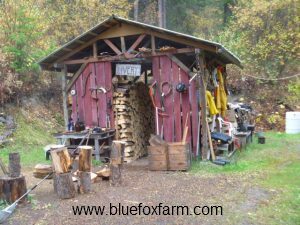 You'll find lots of great materials in old barns, at garage sales or estate sales. I've seen some wonderful sheds and follies with very creatively used old architectural salvage, barnboards and recycled items. Think outside the box. Some of these pictures of rustic garden sheds may prompt you to build one of your own. 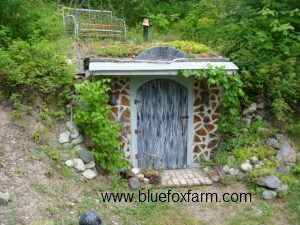 Choose a cordwood earth sheltered root cellar with a Sedum roof, built into the hillside. Unusual and unique, this little root cellar stays at a comfortable 15-20 degrees Celsius in the summer, and above freezing in the winter, even without added heat. The cordwood walls on the front keep the temperature from fluctuating too much, making it the ideal place to store organic vegetables for the winter. Deep snow will help insulate it. The rustic painted door was built from plywood and hand-painted to look like a hobbit door. There is no limit to the imaginative ways to use rustic salvage, like the lamps on the front. These are simply tin cans rusted in the fire and nailed in place on the cordwood. They make perfect little shelves to set the reproduction glass oil lamps on. The rustic Livery is built to resemble a stable from the old west, but is used for storing and drying the firewood for keeping the dwelling warm. This building is 3 meters square, so will hold nine cords of wood - plenty of firewood for this area of cold snowy winters. The wide spaces between the boards allow lots of air movement – as crucial for drying firewood as for ventilation for animals. Build a power shack that looks like an old mercantile building where you would buy dry goods and all your other supplies in a western mining town. Custom built with a hook up for a motor home, power for a freezer and even a phone jack, this is where the power comes from the grid onto the homesite. Room for a freezer and other storage makes this a utilitarian building, as well as a charming addition to the little western town theme. Twiggy hearts on the shutters add even more rustic charm. If all else fails, add a twig or two. Here's a little partly earth sheltered chicken house, which I had so much fun designing and building for my tiny poultry flock. The floor is earthen which is the best for the birds, and also makes it very cool in summer. 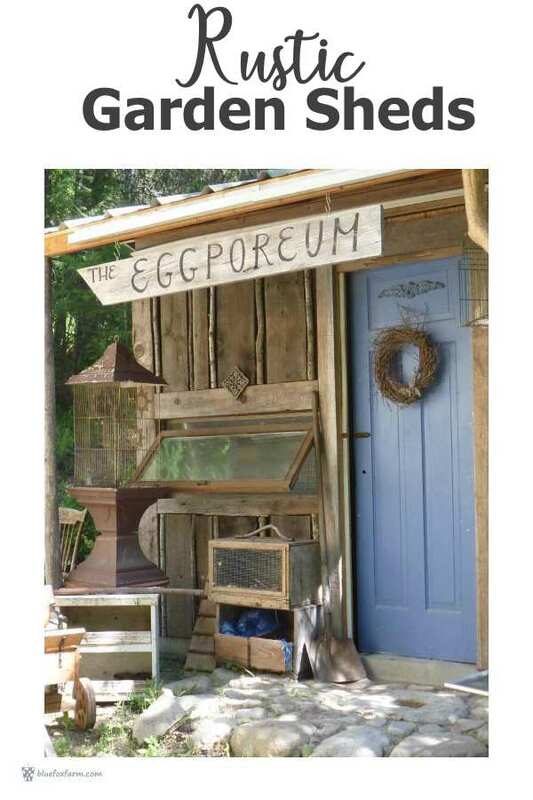 Many recycled items can be found here; the two opening windows, the door with a new coat of pretty Blue Fox blue paint, and lots of other interesting collections. I collect bird cages of all kinds, leaving the door ajar, of course. They fit perfectly with the theme. 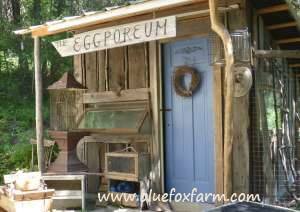 See more about the Eclectic Eggporeum here. 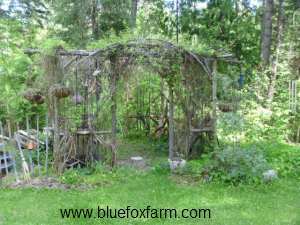 How about a romantic and twiggy rustic gazebo? Although it's not a shed, it's a shady retreat from the hot summer sun, an afternoon seated on a rustic bench in the dappled shade beneath clematis in your bower with a book; bliss. Unique, interesting and fun rustic garden projects like these will make your garden the fascinating place you always wanted. Imagine your visitors delight in these rustic garden sheds. Which will you choose as your favorite? I like them all. Rustic, Funky or Unique - what's your favorite? Do you have a great little garden shed? Share it!